I typically drink river-cooled Pabst Blue Ribbon at my riverside camp. There. I said it, and I’m not ashamed. When I’m done guiding for the day, I like something light and refreshing that won’t affect me to the point of accidentally dropping a three-gallon metal pail of boiling dish water on my feet. I usually crave a cold drink after a long day of pushing and pulling through the wind and waves under the frying sun, but I’m not picky. I want something wet and delicious to soothe my throat after talking about rapids, forest fire ecology, and homesteader history all day. That beer is usually a PBR. I’ve been a professional river guide for 11 years, including four with OARS. Dories inIdaho, and I’ve never been on a craft beer trip. OARS has been boating since 1969, and the summer of 2011 was the first year OARS offered Craft Beer Tasting and Fine Dining trips in Idaho. As a raft guide, I was more than willing to be a guinea pig for this one-of-a-kind trip. Don’t get me wrong; I really do like good beer. I was born and raised in Durango, Colorado, a city with four microbreweries for a mere 16,000 people. I know the difference between an ale and lager, and I know that a cold Ska Brewing Company Pinstripe Red will get me through any amount of yard work, any day. However, I never expected I’d be participating in this deliciously unique river trip. 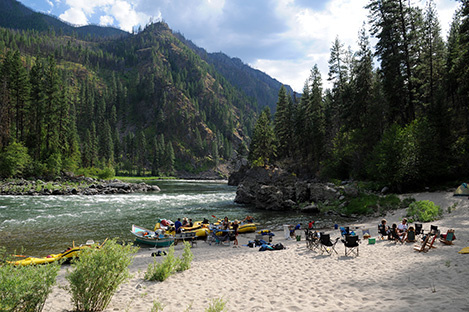 Eighteen guests and eight guides shared a mid-summer week paired with three ice-cold kegs at a time and scrumptious eats on a six-day Salmon River expedition. We also managed to squeeze in some incredible side hikes. Some river trips are all about hiking or fishing, some are about entertaining kids, some are whitewater adrenaline-focused, and some host guests interested in geology. But this trip was about ridding guests of their cell phones, TVs, and city noises, and pairing nature with craft beer and food. It was about getting to know the river canyon, hearing its side creeks gurgle, and overhead ospreys cry, all while learning about beer through the eyes of Fred Colby. Sometimes we would go hours without talking. One passenger lounged half-awake sprawled across the stern of my boat, looking up at Ponderosa boughs passing by. He later told me it was the most relaxed he’d ever been. The trip was also about brewers who were fired up about their creations and their hop-o-philic motives. Colby is a man who can only be described as hop-obsessed. He believes hops are the future of Northwest beer, and wants fellow river travelers along for the bittersweet ride. During daily beer lectures, Colby gave talks on beer-making chemistry and shared inside jokes behind Laughing Dog’s hop-forward, American-style ales. Some days he spoke with a look on his face that seemed like he could hardly believe he was there. Around 3 p.m. each afternoon we reached camp and commenced sitting in our folding chairs, ankle deep in the river. We sipped beer with new friends as we listened to Colby’s countless beer stories under shade tarps and trees, thumbed guitar music, and played a few rounds of Scrabble. We feasted on chef Andy White’s hot-off-the-grill barbecue ribs, artisan pizzas with fresh mozzarella, spinach and arugula salads, decadent Dolmas, prosciutto with melon, and rich, flaky Dutch oven baklavas. Since day one, the group of Laughing Dog brewers had promised us a mob-boss of a beer. They claimed they were saving it for the right moment, swearing that the complex 11 percent ABV brew would astound. And after five days of teasing, The Dogfather Imperial Stout made its dramatic appearance. The palate? Chocolate. Good. Coffee. Good. Fierce loyalties were sworn to this Dogfather (and some unfortunately poor imitations of Marlon Brando were also uttered). This trip took place in the middle of July, in the semi-desert of backcountry super-wilderness known as the Frank Church River of No Return. Worry yourselves not, cold-beer lovers. A pre-chill was achieved with the day’s handpicked kegs receiving a one-hour river bath each afternoon upon reaching camp and before tapping. We brought an additional 160-quart cooler filled with ice blocks exclusively for the three-tap keg jockey. We added a CO² tank to the mix, and the result was astonishingly crisp and carbonated beer that brought on curiously out-of-place goose bumps in the 95-degree heat. Perhaps Laughing Dog could make a River Dog beer. I imagine a brew light and refreshingly drinkable, tasty enough to be distinguished from mass-market lagers, yet mild enough to enjoy while cooking dinner (and not worry about potential second-degree burns). Throw in Laughing Dog’s characteristically righteous hoppiness, and the new beer would be a river trip staple, guaranteed. I’d be happy to professionally field test it, of course. And while I’m asking for things, I would also delight in a canned version of said River Dog beer. I hope to guide next year’s craft beer trip; perhaps I can persuade my boss with a Dogfather. Hmmm… Mr. Colby? Send a case my way, please. And my green tutu while you’re at it, as I believe I saw it on you last.